Our beautifully designed, versatile all purpose chair is ideal for all your light duty exams. It has smooth, piston-controlled recline with spring assistance for easy, smooth transition. Includes removable and adjustable headrest, comfortable footrest and heavy duty base. 360 degree rotation with solid casing, hydraulic piston driven pump that locks in place while working. Reinforced metal frame with reclining handle on both sides for unsurpassed versatility. Shipping Note: Our Exam Chairs are only available for shipping in the continental United States. The freight cost for these items does not calculate when you check out. Items qualify for oversize shipping charges, that will be added to invoice. If you wish to be notified of shipping costs, please indicate at check-out under "Comments". With a weight capacity of 375 lbs. our heavy duty EC-500 has all the versatility and dependability of the EC-400 but with a bit more umph for your larger patients! This beautifully designed, versatile all purpose chair is also ideal for all your light duty exams. With a heavy duty base and a solid casing hydraulic pump, it has smooth, piston-controlled recline with spring assistance for easy transition. 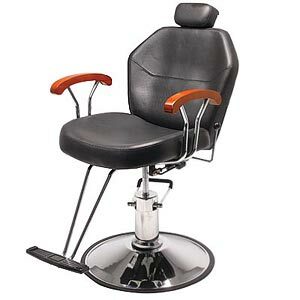 Includes removable and adjustable headrest, comfortable footrest and heavy duty base. 360 degree rotation with solid casing, hydraulic piston driven pump that locks in place while working. Reinforced metal frame with reclining handle on both sides for unsurpassed versatility.